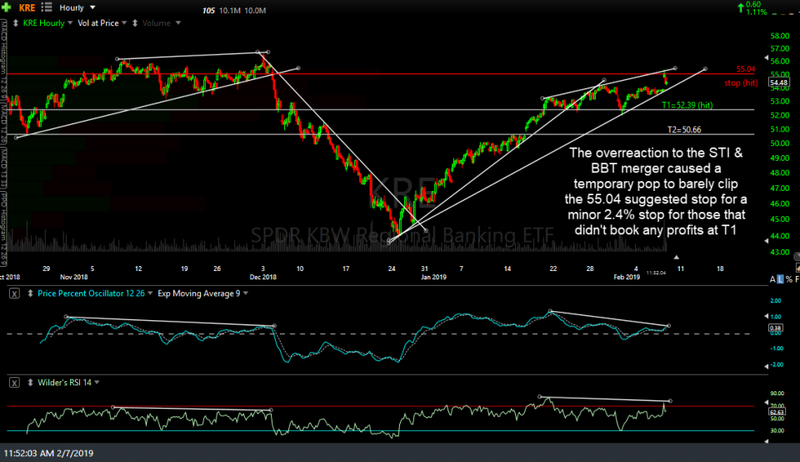 The KRE (Regional Bank ETF) short trade that was entered on January 30th went on to hit the first price target the following day for a quick 2.6% profit. While I expected a bounce off the initial tag of T1, I did not expect the bounce to carry KRE above the suggested stop of 55.04 and I have no doubt that it would not have if it were for today’s untimely announcement of a merger between two of the largest regional banks, BBT (BB&T) & STI (Suntrust). That overreaction to the merger caused a very brief & minor pop above the stop at 55.04, resulting in a minor 2.4% loss for those that did not book partial or full profits at T1. I think the pop on BBT & STI is way overdone & will be faded very soon, most likely starting immediately. 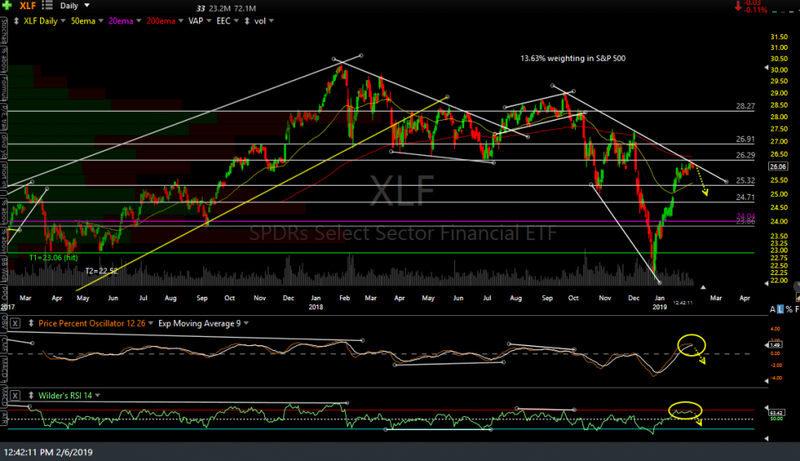 I made a case for a pullback or short on XLF yesterday & I still very much believe that KRE will not only fall as well but fall more than XLF in the coming days to weeks. Even with today’s pop in KRE, which was 100% attributed to the over-reaction to the merger news, absolutely nothing has changed in the technicals & the near-term outlook for KRE. As such, while the KRE swing trade added on Jan 30th will be reassigned to the Completed Trades category due to today’s very brief & minor stop-pop, I am adding KRE back as another Active Swing Short Trade around current levels. The first chart below is the chart posted in the trading room yesterday along with that comment, followed by today’s updated daily chart showing XLF putting in a very impulsive bearish red candle while trading down ~1½% on the day so far. 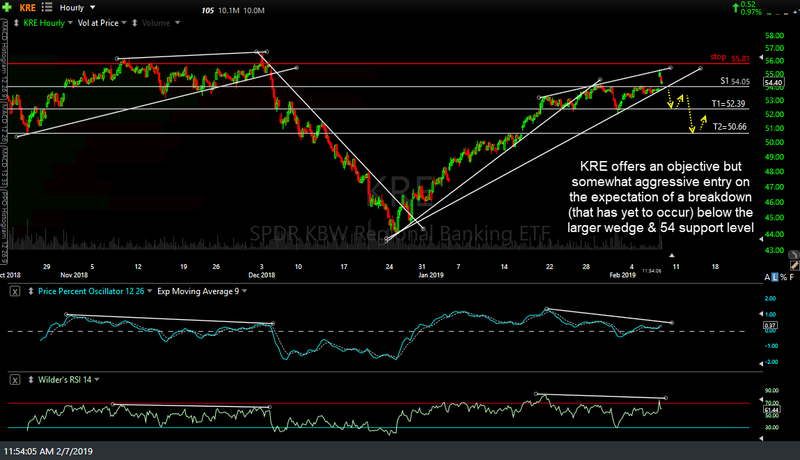 KRE will be added back as another Active Swing Short Trade around current levels. Keep in mind that this should be considered a somewhat aggressive entry, shorting the regional bank sector on the expectation of a breakdown below the larger rising wedge pattern & intersecting 54ish support level, a breakdown that has yet to occur. 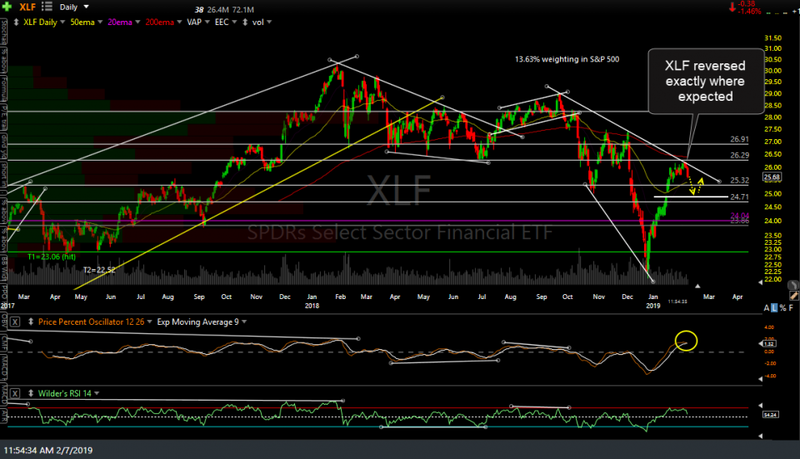 As such, one might opt to use an alternative, more conventional short entry on a break below the trendline & 54.00 level. The price targets for this trade are the same as the previous trade; T1 at 52.39 & T2 at 50.66. However, since we are shorting at a higher level, the suggested stop for this trade will be any move above 55.81, although one might consider employing a stop based on a 60-minute or daily close above that level, as the algos seem very proficient in sniffing out & running well-placed stops in recent months. The suggested beta-adjusted position size for this trade is 1.0. I am new to shorting and trying to learn, so, is WDRW the appropriate vehicle to get me loaded up to short regional banks? same question as above, WDRW appears to have a low volume, any alternative ETF to short it?